A leading medical device manufacturer wanted to create two engaging and informative medical symposiums for over 1100 global surgeons hosted in Rome and Sapporo discussing the latest in orthopaedic surgery. Surgeons needed to be informed about surgical trends, share their experiences and clinical evidence, so that they could improve their own practices and patient care. Organisers wanted to explore new learning opportunities for surgeons to not only create a truly interactive experience but to make training and education more effective and engaging. Using the latest technology, each delegate needed to be able to contribute to discussions easily. With this in mind, we provided each delegate with a tablet equipped with case study backgrounds, surgery photos and x-rays. Throughout case studies and presentations, speakers could ask delegates for their preferred method of treatment by voting on a range of options. 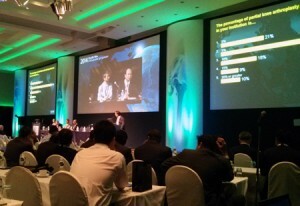 Voting results were then displayed live on a main screen and created further discussion. Delegates were then able to share their knowledge by sending in questions and comments on the Smart Devices. Organisers were then able to view and forward comments onto panel speakers for a wider debate. A separate discussion forum was also created to allow an open and free discussion between delegates. These messages could be viewed on the Smart Device, allowing all delegates to respond directly and discuss any points or issues raised. These comment threads were displayed on a Twitter-style message wall in the exhibition area, allowing delegates to keep up with discussions during breaks in the main programme. Conference organisers could also use the message wall to highlight any logistical arrangements or announcements. To make it easier for delegates to view their entire meeting itinerary, we created a bespoke event app where attendees could view a welcome note, a meeting agenda, a delegate list, information about speakers and presenters. They could also view slides from the presentations as well as abstracts and information about products related to orthopaedic surgery. Floor plans and venue maps were also available to help delegates easily find where they should be for breakout sessions and workshops, as well as timings for the course dinner and airport transfers. 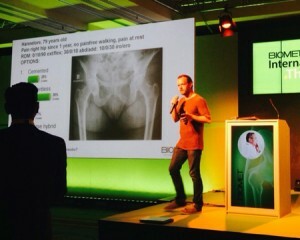 Using our event app’s feedback and survey system, attendees could rate each presentation, as well as request information on orthopaedic products used within the case studies, or those they had seen in the exhibition area. The feedback left by attendees showed which cases and presentations were most valuable to delegates, while the information request form provided the sales department with valuable information about which products were most popular and some leads to be followed up later. The symposiums created a forum for healthcare professionals from around the world to engage and actively participate in discussions. The interactive sessions also enabled everyone to contribute and for different ideas to be put forward. Truly international meeting, with more than 30 countries represented and lots of interaction, great meeting. This meeting is truly innovative with its use of technological equipment. The voting system is impressive and allows everyone to actively participate in the meeting from the very beginning. This meeting provides a nice opportunity for more interactivity than most events, instead of simply sitting and listening to presentations. I just thought I would give you a short update on our first day of our meeting here in Japan. We have about 2 hours before our first day ends but so far, all seems to be going as planned and the Tablets are working exactly as they should be… and seem to be very well received by our attendees. Every time I look around the room I see the surgeons using them and they have been sending up a steady flow of questions using the tablets instead of going to the microphones. Finally, I just want to say how impressed I am with both of your technicians! They have accommodated each and every one of our requests and they clearly know these tablets and the software inside and out! They have been nothing but professional with our surgeons and team members and I just wanted you to know how much I appreciate their support.